The NCEF Pediatric Dental Center has completed over 135,000 patient visits for children from Collier County and surrounding areas. 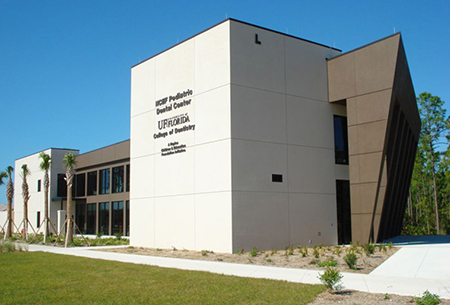 The University of Florida College of Dentistry and Healthcare Network of Southwest Florida have announced a change in the administrative management at the NCEF Pediatric Dental Center. Since opening in December 2008, the center’s operations have been coordinated through a collaboration between Healthcare Network of Southwest Florida and the University of Florida College of Dentistry. Healthcare Network handled operational and clinical administration of the dental center, and UFCD faculty directed the educational and clinical program that provides comprehensive care for children in Collier County. Beginning January 1, 2019, Healthcare Network will transition the administration of the dental center over to UFCD, as Healthcare Network will turn its focus to the Nichols Community Health Center, a new project that will enhance medical and dental health services offered to the community. UFCD will continue to provide the same comprehensive oral health care services and educational programs, and will take over the operational aspects of the center as well. The dental center will remain on the Collier Campus of Florida SouthWestern State College where it has been since its inception. Visit the college’s NCEF Pediatric Dental Center transition web page for more information. Dr. A. Isabel Garcia, dean of the UF College of Dentistry, said that the excellence and continuity of patient care will not be affected by the administrative change. Garcia says she is also grateful for the relationship the dental center enjoys with Florida SouthWestern State College, which has been continuously supportive of UFCD’s educational and clinical care programs. Patients’ families will receive official notification with information for making appointments with the NCEF Pediatric Dental Center and transferring their dental records. The center is also home to an accredited UF pediatric dental residency program, and operates community oral health outreach services including Women, Infants and Children Oral Health, oral health surveillance and screening programs in 32 Collier County schools, a school-based dental sealant program, and a promotora de salud/community health worker. All these oral health services and educational programs at the center will continue. The UF College of Dentistry’s mission is to provide innovative dental education and deliver the highest degree of patient-centered care and service, while promoting discovery and the generation of knowledge through research, with strong commitments to community engagement, diversity and inclusion. Our dental centers in Gainesville, Hialeah, Naples and St. Petersburg complete over 140,000 patient visits annually. For more information, visit the UF College of Dentistry or the NCEF Pediatric Dental Center online, or call 352-273-5953 to schedule an appointment.